The Standard Horizon BQ-160 Perfect Binder is specifically designed for cut sheet applications, while offering a very simple operation. The operator can easily produce professional quality books with minimal training. The Perfect Binder offers a very simple operation, all the operator has to do is insert the book block and press the start button, then place the cover and press the start button again, the glue is then applied on the spine of the book and finally the cover is applied and the book binding is completed. The BQ-160 features an electric book clamp that opens and closes with the simple press of a button for operator convenience, an efficient paper dust vacuum system, nipper height and tilt adjustment, and a dynamic nipper table for auto book sizing. The Standard Horizon Perfect Binder can produce three popular types of binding: perfect binding, tape binding, and pad binding at speeds of up to 180 cycles per hour with books up to 1.6” thick. The BQ-160 offers a double-pass notching function, produces strong book binds and notching can be easily set on or off from the touchscreen. The uniquely designed glue tank ensures superior glue application to the book spine for quality binding. A strong nipper mechanism ensures quality book binds and the nipping pressure, nipping height and angle can be adjusted from the touch screen. The BQ-160 features a power saving mode for when the machine is not used for a predetermined period of time, the glue heater will automatically adjusts to a lower temperature and then the system automatically shuts down. Add the optional CRB-160 Cover Creaser that communicates with BQ-160 binder! With the CRB-160 even heavy-weight cover stock can be used to build crisp, clean and tight books. Eliminate the image cracking of heavier covers and digital printed sheets. 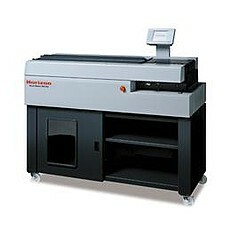 The CRB-160 features a scoring position that is set automatically according to the book thickness inserted into the BQ-160. A wide variety of scoring patterns can be selected from the touch screen and this machine is suitable for crease covers, restaurant menus, greeting cards and all digital print applications. If you have any questions or are interested in purchasing the Standard Horizon BQ-160 Perfect Binder, visit us at SpiralBinding.com. We have great pricing on a full line of Perfect Binding Machines. Call us at 1-800-631-3572 for more information! Yes, I totally agree with you, Horizon BQ-160 Perfect Binder Machines are easy to operate. We also recommend everybody to go with Horizon BQ-250 for more effective work.